Found one file extension association related to Paragon Backup & Recovery Home and 1 file format developed specifically for use with Paragon Backup & Recovery Home. Developer / company: Paragon Software Group. Paragon Backup & Recovery Home is a powerful solution for reliable backup and ultimate recovery. Whether simply saving data, automating backup processes, or creating complex backup routines, this package of useful tools covers all your needs. It quickly backs up your files and folders, your hard disk or even the entire operating system to any storage you choose. Backup & Recovery Home ensures that your system and valuable data are protected dependably - and can be restored in case of any disaster! 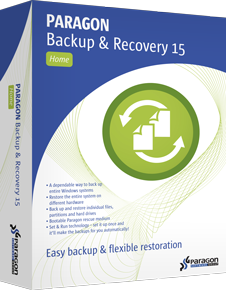 If you need more information please contact the developers of Paragon Backup & Recovery Home (Paragon Software Group. ), or check out their product website.